Have you ever used the internet in order to study Japanese? Or, to rephrase the question, are you using the internet to study at the moment? We think studying kanji and vocabulary online is a really effective way of doing things. So, how about conversation practice? Can you imagine having a conversation on your own, using the internet? Picture yourself facing the monitor - just you - chatting away, as if to no-one in particular. It's nothing to be embarrassed about! In fact, it's a pretty admirable effort, don't you think? 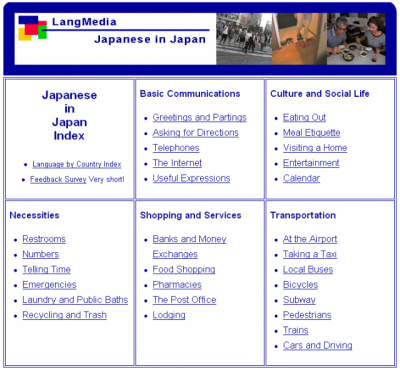 If you're the kind of person who can read and write Japanese fine by yourself, but you don't have any opportunities to speak, you can't find a native speaker to help you, and you lack confidence in your ability, then try practising using this site: Lang Media (Introduction article). We'll show you an example of some conversation practice you can do on your own using this website. The Lang Media website has lots of situations accompanied by videos, scripts and English translations. As well as the conversations found here, there is also some cultural information for you to look through. 1. Click on a topic in which you're interested. Then check out the Japanese-English script, get to know the words and grammar used to understand the contents of the conversation. 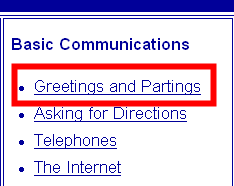 Choose 'Greetings and Partings' from the "Basic Communication" section. Here, you'll find scenes that look at "Greeting a Friend" and "Introducing a Friend", both in an informal setting. There is no Ruby furigana for the Japanese script, so if you aim to understand the meaning in English and try to catch what is said in order to write down the readings of the kanji, you'll find that the conversation makes for good listening comprehension practice. 2. Watch the video and check the contents. If you don't understand something, or don't catch some words, you can listen as many times as you like whilst reading the script. 3. Choose one of the characters, then step into the role of that person to practise speaking. You can look at the script as you practise. 4. Now try without the script. This time, why not try switching off the sound on your PC, then matching your speech with what's happening on the screen. 5. Try having a similar conversation in a practical situation. There are a selection of additional expressions for you to use too. You can learn these along with spoken audio. 1. Try watching the video with no script. Write down any words or phrases you don't understand. 2. Look at the script and check your understanding of the content you heard first time around. 3. Watch the video again, this time writing down the lines you hear spoken. 4. Turn the sound off on the video, then say the lines along to match the video on-screen. 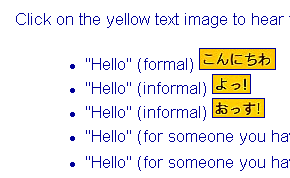 Lastly, try more conversation practice in a similar style. Now, you might not find this to be a particularly Earth-shatteringly amazing proposal for studying conversation, but we think if there's at least somebody out there who is willing to give it a try, then "いいな"...That's a pretty good start! good for who wants to study Japanese language alone.